Too many years passed before Harold "Bud" Kalosky, a former crewman of the destroyer Sproston (DD-577), wrote this slim history of his ship. 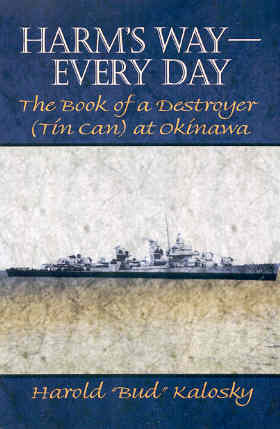 He fills the book with generalities about the experiences of destroyers (tin cans) and their crews during the Battle of Okinawa. He does not include hardly any of his personal experiences, and no other crewmembers contributed stories for this chronological history mainly based on the official ship's log. Even though Kalosky served on Sproston from her commissioning in May 1943 until after the end of WWII, the book only covers between March 21 and June 4, 1945, when the destroyer frequently served at radar picket stations subject to kamikaze attacks around Okinawa. The middle of the book has nine pages with photos of American destroyers damaged heavily in kamikaze attacks, but several of these are not that clear. Kalosky does not list his sources other than the ship's log, but he clearly used at least one other source for the sunk and damaged destroyers that he lists throughout the book by ship name with number of casualties. However, he rarely explains how these ships were sunk or damaged. The Appendix has a four-page list of mainly destroyers, but it does not have a clear purpose, page number references, and any apparent order. Sproston may have been in harm's way every day as the title says, but the author writes that his ship was never close to being hit by a kamikaze aircraft. On March 26, 1945, the crew witnessed a kamikaze plane hit USS Kimberley (DD-521), which killed 4 and injured 54. On May 4, USS Morrison (DD-560) sank after four hits by kamikaze aircraft and lost over 150 men. Sproston looked for survivors from the ship but did not find any. On May 13, Sproston gave assistance to USS Bache (DD-470) under kamikaze attack, but this assistance was apparently limited to a survivor search (not clear for what ship) and an anti-submarine search since Kalosky provides no other details. Sproston gunners shot down or helped shoot down two bombers on May 27 and two more planes in the darkness of the early morning of May 28. After USS Shubrick (DD-639) had been hit by kamikaze aircraft on May 29, Sproston picked up five survivors from the water. Picket station duty at Okinawa ended for the destroyer on June 4, and the ship arrived home in Oakland on July 14 for a boiler overhaul and an upgrade in electronics. The lack of personal stories, limited time frame, and few battle details in Harm's Way—Every Day make this book less informative than other wartime memoirs written by Navy veterans who battled Japanese kamikaze aircraft at radar picket stations around Okinawa.